Size: 5.6" x 3.3" x 0.3"
The PS-9100 Appointment Reminder combined in a handy wallet both an alarm clock and Post-it™ brand notes. The PS-9100 can be set to 6 appointments up to a week in advance. The alarm is audible or silent, time and day of the week are always displayed. 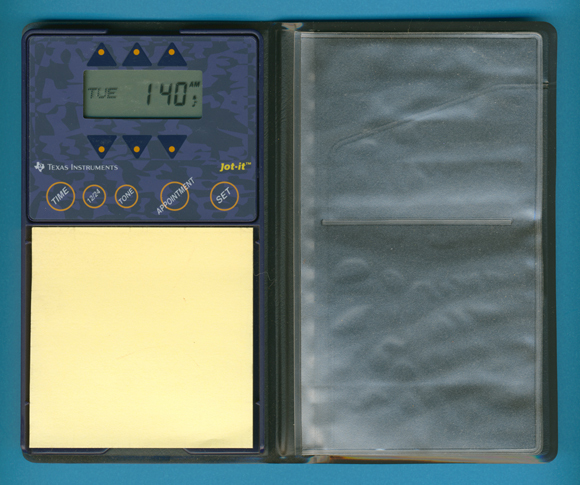 Compare this novelity with the TI-1790 introduced 15 years earlier. The Jot-it™ PS-9100 is featured in the Texas Instruments Incorporated sales catalog CL-1233 dated 1994. Post-it is a trademark of 3M Corporation. © Joerg Woerner, May 22, 2002. No reprints without written permission.